What’s your favorite layering piece to wear these days?! I love cardis, too! And jackets! Great shoes! Looks like a perfect outfit for meetings and such! <3 Love your heels, you can never go wrong with leopard! I love the simplicity of this outfit! So cute! 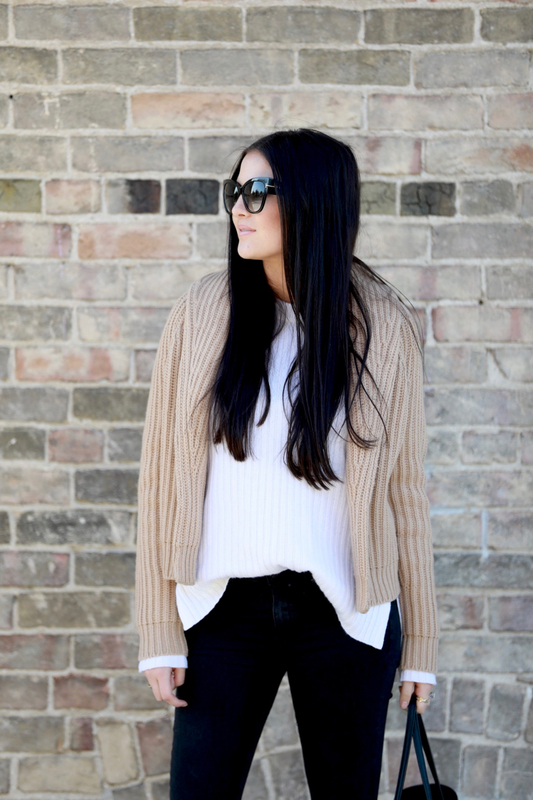 I love to layer with cardigans – they’re so cozy! I have a similar cardigan and love it. Keeps me warm during fall. Also love wearing neutrals with a funky pattern like leopard. Love that cardigan. The cut is so nice, almost like it has a bit more structure to it. Very cute! Cute outfit! Adore those leopard heels!! I have a a few pairs of leopard shoes in various heel heights and style. I just love how they really go with everything. They update any outfit. Thanks for sharing and have a lovely day. Looking good as always! Your Louboutins are always so fresh! Love this outfit! You always have killer jeans. Loving this chic fall look! Perfect colors! Love this outfit, the tote looks so chic!!! Love your casual outfit a lot, that tote and shoes are incredible pieces! I love this entire look, Rach! That cardigan looks incredibly cozy and I love the neutral came color. I’m also really loving that TB bag, too. I’d have to say my favorite layering piece this time of year are moto jackets, they’re my weakness and I love the statement they can make when in a fun color, as well as the warmth they provide. Thank so much for sharing, beauty, and I hope you have the best week ahead! Thank you Jalisa! I love your leopard pumps from your post a few days ago too! Have a great week! You have the best laid back style – also you’re snap story about Isla was hilarious – I’m not going to lie sometimes I look at your life and wonder how you have it so perfect…and then you tell us that story and I love you even more. Thanks for keeping it real. I don’t know how you keep up with how busy your life is! You are wonder woman! love the layered sweaters! super cute look! I love how simple yet classic this look is! Balancing mommy life with a full-time job is always tricky, so I applaud you! I’m wearing leopard print flats today! I love incorporating leopard in a subtle way via my shoes. I love these heels! Yes leopard print adds the perfect amount of pop! I love your cardi and heels. So chic. Love these soft colors…amazing look!! You are gorgeous girl! I love this look, and all of your other ones. You have amazing style, and are truly mom and wife goals! Gorgeous outfit! I absolutely love the look of the layered knits! Plus those heels are beyond! I’m in love with your cardigan! It’s so pretty and comfy! Thanks! It is great for fall! I love a neutral outfit with a pop of pattern! Rachel! I just moved to texas and met a girl at church she’s a doll but the point is her house looks just like yours! I’ve seen people dress like you but never their whole house!!! total custom house, I’m almost positive she used your house for inspiration!!! anyway her house is of course amazing! I lo e your house pics! I can’t wait until our house is built hopefully january it will be done! I am dreaming using sapphire somewhere. I love how you used it in your powder bath and how cute your pics were with you and your husband painting it!!! and your new baby boy omgggggg!!!! such a babe! 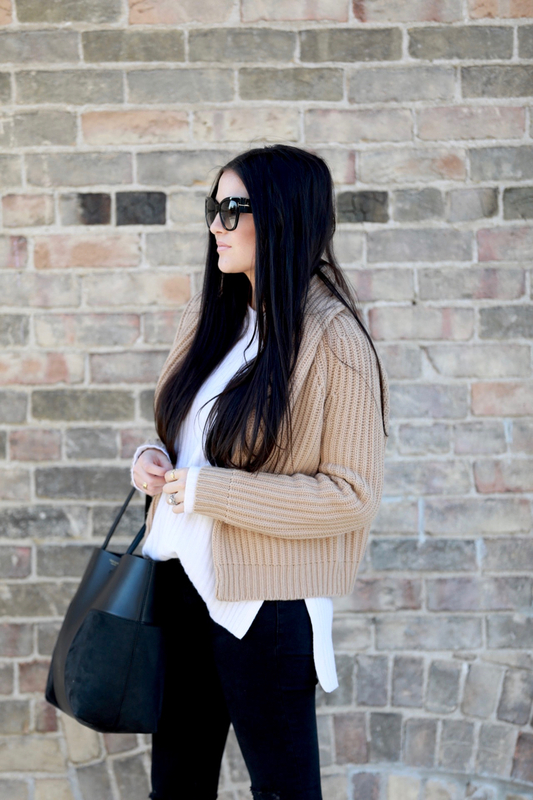 Love how cozy that tan cardigan is! Leopard heels ? so gorgeous! Although, I think that heel height is a little too much for me to tackle! what size are you wearing in the cardigan?? I can’t figure out what size to get!